Hey there, been a little while since I posted. I had become somewhat lazy and complacent, knowing that I had a recipe bank of around 10 recipes waiting to be written and posted. But then things aren't that easy as we all know. What with spending time with my daughter and wife during the weekends, coupled with other social outings, I didn't find the appropriate time to post a recipe. Right now I am writing this post squeezing it in before the Saints-Vikings game. What a game that Jets-Colts turned out to be. Lot of fun, always, the NFL playoffs. Anyway, back to the subject matter. Some weeks ago I had purchased butternut squash thinking I would make a chicken dish with it. Never ended up doing that, and instead made a simple soup combining the squash with fennel producing a soup bursting with flavor. First, slice both the ends off the butternut squash so it can stand up. This way, cutting the squash vertically in one half becomes easy. After cutting the squash and scooping out the seeds, take a baking tray and drizzle some olive oil on it. Lay the squash inside out and bake it at 350 degrees for around 45 minutes or until nicely roasted and cooked. You can also boil the squash in water and cook it faster, but it won't taste as good as when it is roasted. 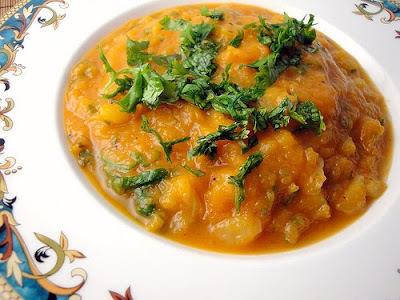 Scoop out the cooked squash from its skin and mash it with a hand blender or with your hands until it is a smooth puree. Set aside. In a wok or a pan, on medium heat, add the olive oil. When the oil is a little hot, add the cumin and fennel seeds. After 10 seconds or so add the cut fennel root, and saute until the fennel is golden brown. Sprinkle in salt and black pepper for seasoning, and add the cayenne pepper as well. Saute for a couple minutes more and add the squash puree. Add 1/2 cup of warm water, mix everything well and heat it on low to medium flame for 5 minutes. Garnish with the coriander and parsley leaves on top with a little drizzle of browned butter and you are done. Serve this delicious soup hot in a bowl with a side of toasted bread, buttered up if you want to indulge. Ingredient Substitute/s: If you are a vegan, just omit the browned butter addition at the garnishing stage. Fennel can be replaced with onions, and the butternut squash can be replaced with yam or pumpkin or vegetables in the same family.